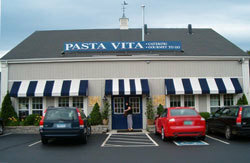 Born as a wholesale pasta factory, Pasta Vita has matured into Connecticut&apos;s leading Gourmet-To-Go retail operation. After a 30-year successful career with IBM, Rich Cersosimo, President of Pasta Vita, knows the importance of quality and customer satisfaction. His partner Luis Castanho, "Chef Lou," a distinguished chef and graduate of the Culinary Institiute of America, prides himself on producing meals using only the freshest and highest quality ingredients. Every day in our store, we feature over 100 freshly prepared entrees, vegetable dishes, salads, sauces, soups, breads and desserts. All of our items are prepared fresh daily for you to take home. Our entrees can be frozen to be enjoyed at a later date. We also feature over 25 varieties of our famous specialty-striped ravioli, made with all-natural ingredients. Together, with our competent staff, we are committed to bringing you the best selection chef-made meals anywhere in Connecticut.